Like any craftsman, I have accumulated quite a few tools during my embedded software development career. Some of them proved to me more useful than others. And these generally useful tools ended up in my Embedded Toolbox. In this blog, I’d like to share some of my tools with you. Today, I’d like to start with my cross-platform Programmer’s Calculator called QCalc. I’m sure that you already have your favorite calculator online or on your smartphone. But can your calculator accept complete expressions in the C-syntax, which you can cut-and-paste directly to and from your embedded code? How many buttons do you need to push to see your result in decimal, hex and binary? Well, QCalc can do this with less hassle than anything else I’ve seen out there. I begin with describing QCalc features and then I tell you how to download and launch it. This entry was posted on Tuesday, June 27th, 2017 at 2:32 pm	and is filed under productivity. You can follow any responses to this entry through the RSS 2.0 feed. You can leave a response, or trackback from your own site. 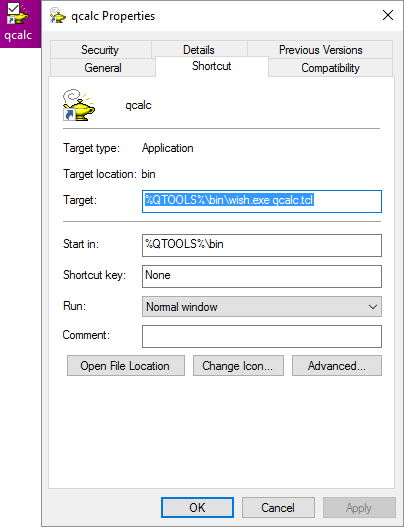 Wish.exe is included (obviously) only in the QTools collection for Windows (installer qtools_win32_.exe). It is not included in the QTools collection for POSIX/Linux (qtools_posix_.zip), so please make sure that you download and install the correct one. Again, QTools installers are available for download from: https://sourceforge.net/projects/qpc/files/QTools . I’ve found SpeedCrunch (speedcrunch.org) which is excellent – perhaps even better than QCalc – and cross platform. Seems to support all the same things, plus more. Great tool, simple and straight to the point as i like it. Many thanks for sharing. Hi. I have been using it for years. Any plans for support 64bit word?